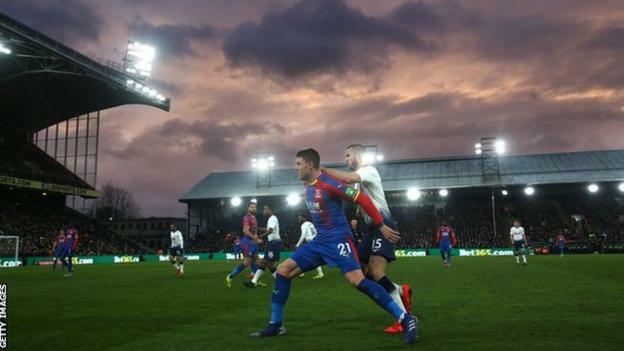 Tottenham went out of their second knockout competition in four days after defeat by Crystal Palace in the FA Cup fourth round at Selhurst Park. Having lost a Carabao Cup semi-final to Chelsea on penalties on Thursday, Spurs were 2-0 down inside 35 minutes. Connor Wickham marked his first start since November 2016 with a goal before a penalty by ex-Spurs midfielder Andros Townsend doubled the lead. It was their third miss from the spot in two games after Lucas Moura and Eric Dier failed in Thursday’s shootout at Stamford Bridge as Spurs went out of the EFL Cup. A much-changed Tottenham side were lacklustre against Palace. On the few occasions they did create serious chances, they could not find a way past Julian Speroni, with the 39-year-old Argentine keeper making crucial saves to keep out Georges-Kevin N’Koudou and Fernando Llorente. 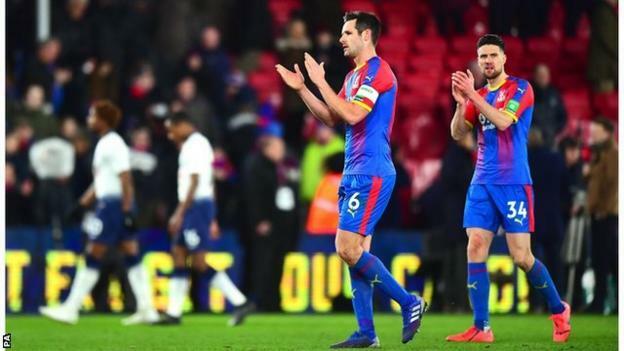 Palace fans celebrated wildly at the final whistle after a first win over Tottenham since 2016 saw them advance to the fifth round for the first time since the 2015-16 season, when they went on to reach the final. The FA Cup was seen as Tottenham’s most realistic chance of winning a trophy, as they failed to reach the EFL Cup final, sit nine points behind leaders Liverpool in the Premier League and face an awkward last-16 Champions League tie with Bundesliga leaders Borussia Dortmund. Yet with Harry Kane and Dele Alli injured and Son Heung-min absent after international duty with South Korea, Spurs failed to score for only the third time in 36 league and cup games this season. Mauricio Pochettino made seven changes, with French winger N’Koudou – making his first start for the club since December 2017 – among those given a chance to impress. However, they failed to recover from a poor start in which Jeffrey Schlupp powered past Davinson Sanchez for Wickham’s goal and a blatant handball by Kyle Walker-Peters gifted Palace a penalty and a commanding lead. With his side trailing 2-0, N’Koudou was twice denied in quick succession by Speroni when Palace were down to 10 men after Joel Ward was off the pitch for treatment to a cut nose. Speroni did not even have to make a save from Trippier’s penalty, awarded after Patrick van Aanholt kicked the back of Juan Foyth’s leg, with the England defender putting his attempt wide. Spurs improved after the interval but were frustrated by Speroni, who produced a fine diving stop to keep out a shot on the turn by Llorente. Tottenham are the 13th Premier League club to go out of the FA Cup before the fifth round, adding to the frustration for a club whose title chances have suffered following two home league defeats. As they wait for their new stadium to be completed, they cannot leave Wembley quickly enough, but cannot get there for a cup final. Roy Hodgson’s Palace now have wins against Manchester City and Tottenham this season, as well as hard-earned draws against Arsenal and Manchester United. Staying in the Premier League is the number one priority but Hodgson will hope this result – and performance – can act as a springboard for the rest of the season. They never looked back once Wickham, who has been dogged by injury problems, scored his first goal in 799 days – Paulo Gazzaniga pushing Schlupp’s attempt into the path of the forward. Wickham, who was joined by most of his team-mates, dropped to his knees and banged his fists on the ground during an emotional celebration. Palace doubled the lead through life-long Spurs fan Townsend who did not celebrate scoring his penalty. Moments later, he should have made it 3-0, shooting straight at Gazzaniga, but it did not prove costly as Palace protected their lead and hang on for a deserved victory. Crystal Palace boss Roy Hodgson on Connor Wickham: “For Connor, to play and crown it with a goal, that’s good news. “Two years and three months… incredible. It’s a credit to him. “He’s worked hard to get to where he is. Spurs have lost three of their past four games in all competitions – as many as in their previous 22 games combined. Andros Townsend’s past two FA Cup goals have been penalties scored in the fourth round – in 2014-15 for Tottenham against Leicester and in this game against Spurs. Excluding shootouts, Kieran Trippier became the first Spurs player to miss an FA Cup penalty since Tom Huddlestone in February 2010 against Bolton. Spurs have only failed to score in two of their past 21 FA Cup matches – both against Crystal Palace. Spurs need to get their season back on track and host Watford at Wembley in the Premier League on Wednesday (20:00 GMT) while Palace are at Southampton on the same night (19:45). Match ends, Crystal Palace 2, Tottenham Hotspur 0. Second Half ends, Crystal Palace 2, Tottenham Hotspur 0. Juan Foyth (Tottenham Hotspur) wins a free kick on the left wing. Attempt missed. Victor Wanyama (Tottenham Hotspur) header from the centre of the box misses to the left. Assisted by Erik Lamela following a set piece situation. Corner, Crystal Palace. Conceded by Victor Wanyama. Oliver Skipp (Tottenham Hotspur) wins a free kick in the defensive half. Substitution, Crystal Palace. Jordan Ayew replaces Andros Townsend. Attempt saved. Wilfried Zaha (Crystal Palace) right footed shot from the left side of the box is saved in the bottom left corner. Assisted by Christian Benteke. Attempt blocked. Erik Lamela (Tottenham Hotspur) left footed shot from the centre of the box is blocked. Assisted by Fernando Llorente. Substitution, Tottenham Hotspur. Kazaiah Sterling replaces Lucas Moura. Corner, Tottenham Hotspur. Conceded by Joel Ward. Substitution, Crystal Palace. Luka Milivojevic replaces Max Meyer. Attempt saved. Erik Lamela (Tottenham Hotspur) left footed shot from outside the box is saved in the centre of the goal. Assisted by Kieran Trippier. Attempt blocked. Kieran Trippier (Tottenham Hotspur) right footed shot from the right side of the box is blocked. Assisted by Fernando Llorente. Attempt blocked. Juan Foyth (Tottenham Hotspur) right footed shot from outside the box is blocked. Assisted by Erik Lamela. Attempt missed. Lucas Moura (Tottenham Hotspur) header from the centre of the box is high and wide to the left. Assisted by Georges-Kévin Nkoudou with a cross following a corner. Substitution, Crystal Palace. Christian Benteke replaces Connor Wickham. Attempt missed. Kieran Trippier (Tottenham Hotspur) right footed shot from the right side of the box misses to the left. Assisted by Erik Lamela. Attempt missed. Victor Wanyama (Tottenham Hotspur) right footed shot from outside the box misses to the left. Attempt blocked. Erik Lamela (Tottenham Hotspur) left footed shot from the centre of the box is blocked. Assisted by Lucas Moura.